As the pharmaceutical industry fights off a flood of lawsuits, there’s an increased call to investigate the roles of executives pushing opioid painkillers. The Purdue Pharma offices in Stamford, Connecticut. 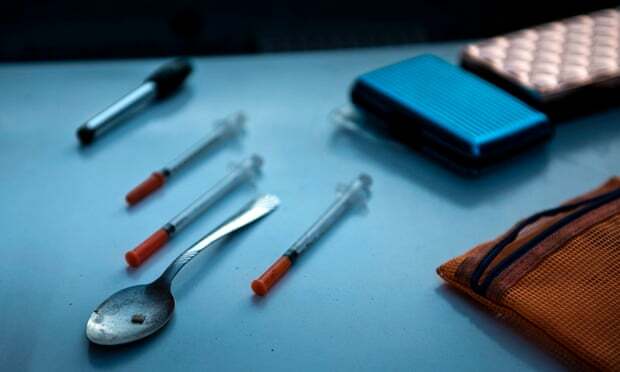 30 Sep 2018 – The mayor of the West Virginia city that has come to symbolise America’s opioid epidemic has called for the jailing of pharmaceutical company executives he likens to street corner drug dealers. Steve Williams, mayor of Huntington, a city ravaged by prescription pill and heroin addiction, said he wants to see executives face criminal prosecution, after it was revealed that a member of the family that made billions of dollars from the painkiller that unleashed the epidemic stands to profit further after he was granted a patent for an anti-addiction medicine. Activists have backed Williams’ call amid an increasing focus on the role of drug company executives in pushing opioid painkillers as the pharmaceutical industry fights off a flood of lawsuits over an epidemic estimated to have claimed at least 350,000 lives. OxyContin medication on a pharmacy shelf in Provo, Utah. In June, Massachusetts became the first state to sue individual executives and owners of Purdue Pharma, the maker of the drug, OxyContin, which kicked off the biggest drug epidemic in American history, estimated to be killing more than 115 people a day. The lawsuit seeks to recover the billions of dollars in profit banked by members of the Sackler family, which owns Purdue and is divided between the US and the UK. Massachusetts attorney general Maura Healey, accused the company and its officials of knowingly profiting from overdoses and death. “Purdue Pharma and its executives built a multi-billion-dollar business based on deception and addiction. The more drugs they sold, the more money they made, and the more people in Massachusetts suffered and died,” she said in announcing the lawsuit. Purdue has vigorously rejected the accusations but the Massachusetts case is only one of more than a thousand against the firm and part of a wave of actions against opioid makers, distributors and pharmacies that some lawyers predict will result in a total settlement that dwarfs the $246bn paid out by tobacco companies over smoking deaths. Williams was among the first mayors to pursue the drug companies. West Virginia has the highest drug overdose rate in the US. Huntington is capital of the county with the largest number of opioid deaths in the state although it has brought the toll of addiction down sharply over the past year. Paraphernalia for smoking and injecting drugs after it was found during a police search on 19 April 2017, in Huntington, West Virginia. Williams wants to see a substantial settlement agreed swiftly to help fund programs to deal with the consequences of the epidemic, such as residential addiction treatment and care of children orphaned by drug overdoses. But he is not alone in believing that the crisis spread unchecked for years in part because big corporations were allowed to pay fines or civil penalties when they broke the law and then carry on as before. The mayor questions whether civil suits alone are sufficient to call those responsible to account and to discourage what he regards as a lethal disregard for the law. “I can guarantee you this, that if an executive all of a sudden knew that they were going to be hearing iron doors closing behind them that would immediately send a ripple throughout all of the corporate boardrooms. All it takes is one public execution,” he said. That may come in the form of a pending prosecution against the billionaire founder and CEO of the drug-maker Insys Theraputics, John Kapoor, on racketeering, conspiracy and corruption charges. Kapoor has denied allegations of bribing doctors to prescribe a powerful and highly addictive opioid approved for cancer patients, Subsys, for people who did not have the disease. An Inysys sales manager has already pleaded guilty to paying kickbacks to doctors to prescribe Subsys and in August the company paid $150m to settle the justice department investigation into its practices. But critics of the industry say Insys was a latecomer to profiting from the epidemic, opportunistically seizing on the chance to sell more drugs only in recent years. They point to Purdue and other firms pursuing a much longer strategy of misrepresenting and promoting opioid painkillers, including using political lobbying and well-funded front organisations to influence medical policy, and then resisting efforts to reduce mass prescribing even as the death toll rose in order to preserve profits. It’s a prospect that appears to be of concern to Purdue among others. Earlier this year, the Intercept revealed that the company helped fund an effort by the Washington Legal Foundation, a conservative group that litigates on behalf of corporate interests, to weaken laws holding executives criminally responsible for breaches of the law. The foundation, which defended the tobacco industry in court, made a failed attempt last year to get the supreme court to overturn the convictions of the owners of a chicken factory farm over a salmonella outbreak. In 2007, Purdue Pharma pleaded guilty to criminal charges of falsely marketing OxyContin, including telling doctors it was less addictive and more effective than other prescription opioids. 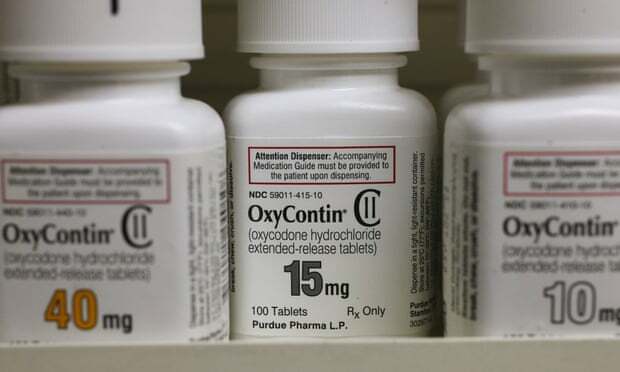 The pharmaceutical firm paid a $640m fine but negotiated for the conviction to be pinned on its parent company, Purdue Frederick, which allowed the drug maker to go on selling OxyContin unhindered by restrictions that would have come with a criminal conviction. Three top executives responsible for the illegal marketing were allowed to plead guilty to misdemeanours and fined heavily but were not jailed. Members of Congress questioned the lenient sentences at the time. Senator Patrick Leahy told a hearing that “nothing makes corporate executives think twice about malfeasance more than the prospect of the iron bars slamming shut”. Senator Arlen Specter called fines “expensive licenses for criminal misconduct”. 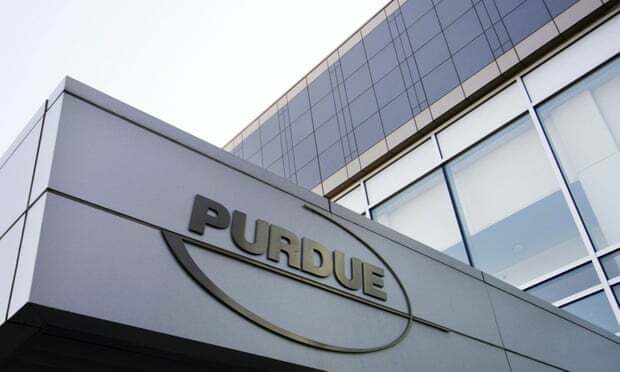 The present wave of lawsuits accuse Purdue Pharma of continuing its criminal practices and of regarding financial penalties as the cost of doing business – an accusation leveled against a number of other drug makers, distributors and pharmacy chains that have paid civil settlements sometimes into the hundreds of millions of dollars but avoided criminal prosecution even when they repeatedly committed the same infractions. A former head of the Drug Enforcement Administration division responsible for ensuring drug distributors follow their legal obligations, Joe Rannazzisi, spent years pressing for stiffer penalties and criminal prosecutions of wholesalers for breach of laws requiring them to cut off suspiciously large orders to pharmacies tied to illegal “pill mills”, but he ran into the power of the industry’s political lobbying. “We were pressing for any kind of prosecution we could get. But that was never going to happen,” he said. Rannazzisi said the fines and civil settlements were not an effective deterrent. “They were making a lot of money so why the heck are they going to change their way of doing business when they’re bringing all this money in? They didn’t want to change the way they were doing anything,” he said. Anger over the lack of accountability was sharpened earlier this month when the Financial Times revealed that Dr Richard Sackler, an executive in the company who was instrumental in it’s marketing of OxyContin and one of those named in the Massachusetts lawsuit, was revealed to have patented an anti-addiction medicine in what appeared an effort to profit further from the tragedy his company was instrumental in creating. Williams’ call for criminal penalties also comes amid growing anger at attempts by the drug-makers to defend themselves from lawsuits by blaming the victims of addiction and the doctors who prescribed the pills. Purdue is conducting a public relations campaign to portray itself as committed to combatting the epidemic. In newspaper adverts the company claims to be a “partner” in the fight against opioid addiction. “We manufacture prescription opioids. How could we not help fight the prescription and illicit opioid abuse crisis?” it pleads. But in court, Purdue is pursuing a legal strategy of blaming the “abusers” and their doctors not OxyContin or the manner in which it was sold. “The alleged nuisance in this case is not caused by Purdue’s sale of its legal, FDA-regulated medications, but rather by doctors who wrote improper prescriptions and/or by third parties who caused persons without valid and medically necessary prescriptions to get opioid medications or illegal street drugs. Purdue has no control over those persons,” the company said in a legal defence against a lawsuit by the state of Tennessee. Purdue and other drug makers paint those who became dependent on opioids, and then sought pills on the black market or were drawn into dealing to pay for drugs, as criminals unworthy of compensation. It also argues that the wide prescribing of the drug followed guidelines set by independent organisations such as the American Pain Society. But Purdue paid millions of dollars to the APS and other groups that pushed mass prescribing of its pills. Another drug-maker, the Irish company, Endo, has defended itself from lawsuits by describing the epidemic as “a complex problem with root causes that are difficult to disentangle” and objected to accusations by Ohio’s attorney general, Mike DeWine, that the pharmaceutical industry “laid waste to Ohio as only the worst plague could” as a “stunning oversimplification” and “offensive”. Endo said “litigation and vilification” would not bring about an end to the crisis. Paul Farrell, a Huntington lawyer who watched the tragedy unfold in his hometown, is now one of the three co-leads for about 600 combined lawsuits by cities, states and counties being heard at a federal court in neighbouring Ohio. He dismissed the industry’s attempts to shift responsibility for the epidemic. “If they want to turn around and blame the drug addicts, there’s a fundamental misunderstanding of what this case is. This is a community of mothers and fathers and brothers and sisters that are standing up and saying that the poison that has killed our children, killed our family members, we’re no longer going to tolerate it. So they can try to point the finger around as much as they want but that does not diminish the fact that there is a substantial liability in this case,” he said. Farrell said he has a “very strong view” on whether executives should face criminal prosecution but declined to express it directly. “If you think about any of the natural disasters, if you think about the BP or the Exxon Valdez, there needs to be a root cause analysis performed to figure out what went wrong and why, and if there was criminal behaviour then I’m certain there will be an accounting for it,” he said. Chris McGreal is a regular writer for Guardian US and a former Guardian correspondent in Washington, Johannesburg and Jerusalem. His book, American Overdose: The Opioid Tragedy in Three Acts, is published in November. Now that “corporation masquerading as a human” Kavanaugh is on the SCOTUS the bosses can stop worrying about any consequences of their evil actions on “ordinary people” who have no values of course.